The latest issue of Focus on the Region is now online! 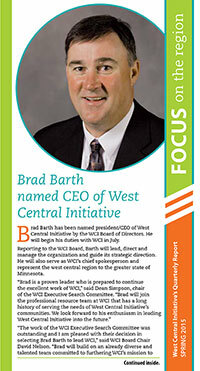 Meet incoming President/CEO Brad Barth and learn the five things you should know about him! Knute Nelson Foundation awarded WCI Competitive Workforce Grant. Thanks, Valspar for 16 years of making "Minnesota Beautiful." We couldn’t do as much without our funders. Making the most of a bequest to benefit your favorite charities AND your family.